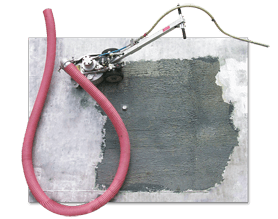 It’s amazing how many product removal problems can be solved with high-pressure water jets. And no one harnesses the power of water like NLB. In paint shops and parking decks, refineries and shipyards, productivity is the name of the game. NLB has spent more than four decades helping customers complete jobs quickly and ergonomically, with minimal downtime. Also with minimal clean-up, because nothing is more environmentally-friendly than water.